Stock # HEB76321, 6.7L 8-Cyl Engine, Automatic, 28900 mi. 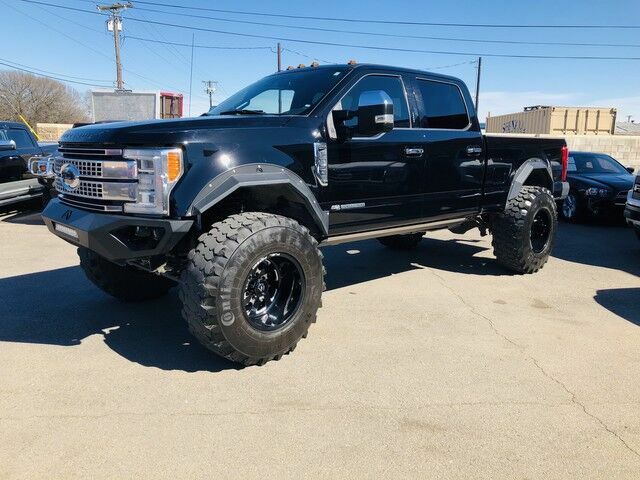 Auto Source of Texas is honored to present a wonderful example of pure vehicle design... this 2017 Ford Super Duty F-350 SRW Platinum only has 26,100mi on it and could potentially be the vehicle of your dreams! This Ford includes: UPFITTER INTERFACE MODULE (LPO) TWIN PANEL POWER MOONROOF Driver Vanity Mirror Passenger Vanity Mirror Generic Sun/Moonroof Passenger Illuminated Visor Mirror Sun/Moonroof Driver Illuminated Vanity Mirror PLATINUM ULTIMATE PACKAGE Driver Vanity Mirror Lane Departure Warning Passenger Vanity Mirror Back-Up Camera Generic Sun/Moonroof Passenger Illuminated Visor Mirror Sun/Moonroof Driver Illuminated Vanity Mirror Cruise Control Cross-Traffic Alert ENGINE: 6.7L POWER STROKE V8 TURBO DIESEL B20 Diesel Fuel 8 Cylinder Engine Turbocharged SHADOW BLACK TOUGH BED SPRAY-IN BEDLINER Bed Liner UPFITTER SWITCHES ULTIMATE TRAILER TOW CAMERA SYSTEM Back-Up Camera BLACK/BRUNELLO, UNIQUE PLATINUM LEATHER 40/CONSOLE/40 SEATS Cooled Front Seat(s) Heated Front Seat(s) Bucket Seats ADAPTIVE CRUISE CONTROL Cruise Control Cross-Traffic Alert TRANSMISSION: TORQSHIFT 6-SPEED AUTOMATIC (6R140) Transmission w/Dual Shift Mode A/T 6-Speed A/T FX4 OFF-ROAD PACKAGE *Note - For third party subscriptions or services, please contact the dealer for more information. * Drive home in your new pre-owned vehicle with the knowledge you're fully backed by the CARFAX Buyback Guarantee. CARFAX shows that this is a one-owner vehicle -- no wonder it's in such great condition. Quality and prestige abound with this Ford Super Duty F-350 SRW. Where do you want to go today? With 4WD, you can choose to drive virtually anywhere and on terrain 2WD vehicles can't handle. The Super Duty F-350 SRW Platinum has been lightly driven and there is little to no wear and tear on this vehicle. The care taken on this gently used vehicle is reflective of the 26,100mi put on this Ford. Added comfort with contemporary style is the leather interior to heighten the quality and craftsmanship for the Ford Super Duty F-350 SRW This incredibly rare Ford Super Duty F-350 SRW Platinum is a work of art and is the type of vehicle a true automotive aficionado will appreciate for a lifetime. You'll see the world in a whole new way thanks to the navigation system that comes with this vehicle. Feel pleased in your decision to buy this Ford Super Duty F-350 SRW as it's still covered under the manufacturer's warranty. When this vehicle was shipped from the factory, Ford decided that no option should be left off of this magnificent automobile. So, if you're in the market for a Ford Super Duty F-350 SRW Platinum that is equipped with copious amounts of options, then we may just have the perfect vehicle to suit your needs. Fast, yet nimble, this highly refined automobile will turn heads wherever you go, provided of course, they even see you. This wonderfully maintained Ford Super Duty F-350 SRW is in the top 10% of its class when it comes to cleanliness and condition. Upgraded wheels enhance the look of this Ford Super Duty F-350 SRW.